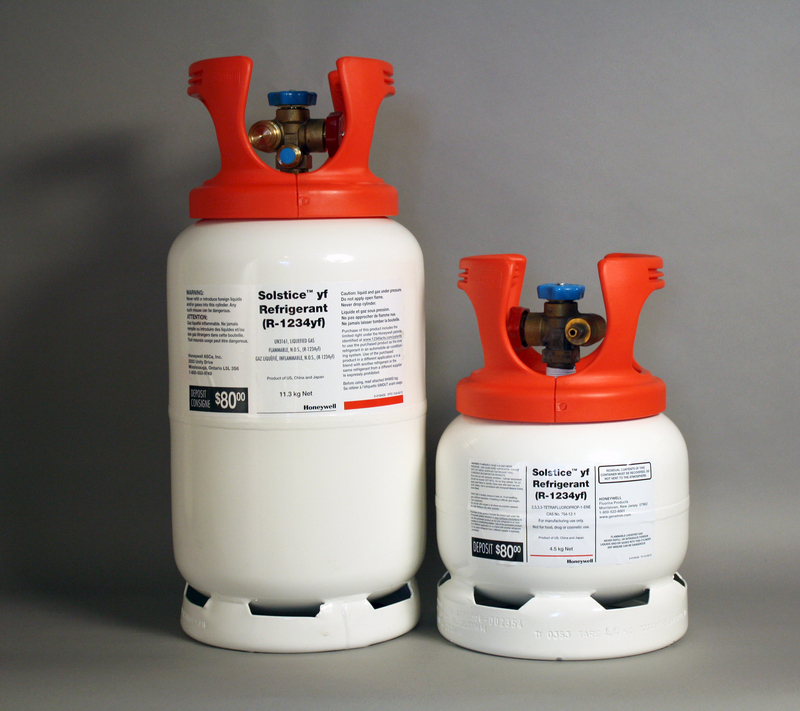 What will the new refrigerant be? That has been the most dynamic issue surrounding the future of the mobile A/C industry for the past few years. I recently had a conversation with MACS member Tom Morris of Honeywell, who shared some insight with MACS, and took the time to answer a few questions we commonly hear from our members. Here’s part one of Steve’s YF Blog series, covering some of what we discussed. Question: Can you tell me what vehicles (in what countries) are currently in production using R-1234yf? “Right now, Europe is the one region with a mandatory phase out for R-134a.” Tom explained that this applies to any new vehicle platform that comes out after 2013 (originally it was 2011), and that new vehicle platforms come out every few years. Additionally, by 2017 you can no longer use a refrigerant in new vehicles with a GWP (Global Warming Potential) of greater than 150. Some of the auto makers there are developing carbon dioxide based systems, but Honeywell is seeing a lot of pick-up of the R-1234yf refrigerant in Europe and around the world. Tom said that the second major area that uses it is the United States. “When they put in the new fuel economy standards for ‘12 thru ‘16 and now ‘17 thru ‘25, there is an incentive or a credit you can get towards your tail pipe emissions for using a low GWP refrigerant. So, because of that, several US manufacturers are using it.” From a sales standpoint, those are the two markets. But in reality, this product is being shipped elsewhere. It’s being shipped to Japan, to Korea, and other places where cars are made and imported into the US and Europe. Some cars are also occasionally being exported. For example, if you buy say a Land Rover in perhaps South America, and the US versions have yf, those export versions may also have it, though none have yet been confirmed. Keep in mind that this isn’t an all-inclusive list, and not all of these vehicles may be using Honeywell’s refrigerant, but they’re still using yf just the same. Also, some of these may be models sold only in Europe. The red color used on a cylinder of R-1234yf is indicative of the material’s flammability. Honeywell estimates that there are more than a million cars on the road today that contain yf, and by the end of the year anticipates there will be more than two million. Sounds pretty amazing that it can double in only a few months’ time, but if you think about it, Europe makes about 12 million new cars every year, and each new platform that comes out needs to covert, and the US credits make it worthwhile as well. On July 9th of this year, the EPA issued a proposed rule which would change the listing status for certain substitutes under the Significant New Alternatives Policy (SNAP) program. Under this proposed rule, various hydrofluorocarbons (HFCs) and HFC-containing blends that were previously listed as acceptable alternatives to ozone-depleting substances (ODS) will be listed as unacceptable for some uses. This proposed rule is part of the SNAP program, under which the EPA continuously reviews alternatives to ODS to find substitutes that pose less overall risk to human health and the environment. As safer alternatives become available for particular applications, the list of acceptable substitutes is evaluated and revised. This is somewhat similar to what’s happening in Europe. “Now, that’s just a proposed rule” said Morris, “but Honeywell expects within 6 to 9 months that rule would become final.” What does this mean to US manufacturers? If you can’t use R-134a on new production vehicles after 2021, and in the mean time you can get credits towards fuel economy, it might be considered to use (an alternative refrigerant) on new models in ’15, ’16 or ’17. After all, these credits are a form of currency which you can bank, trade and sell. Tom followed up by explaining that Honeywell expects Europe’s 12 million annual production cars to stop using R-134a by 2017, and while they’re not required to use this specific product (R-1234yf), the vast majority of manufacturers have indicated their intentions of doing so. Mobile A/C professionals should plan to attend 35th annual Mobile Air Conditioning Society (MACS) Worldwide Training Conference and Trade Show, Meet me at MACS Make Connections that Matter, February 5-7, 2015 at the Caribe Royale, Orlando, FL. This entry was posted in #1234yf, Automotive, Automotive Aftermarket, Automotive training, Mobile Air Conditioning, Refrigerants and tagged #air conditioning, #MACS Member, #Macs worldwide, #Mobile Air Conditioning Society, 1234yf, HFC-134a, professional service, refrigerant. Bookmark the permalink.